We’ve been an independent operation since we started nearly 18 years ago and whilst we were a Vauxhall franchised operation for a while we’ve always enjoyed the freedom that being independent gives you from the manufacturer and their rules and fees. The downside to this of course is the suggestion (always made by the manufacturer or their dealers) that somehow being an independent means we dont have the skill or knowledge to work on their cars and our response to this is always the same – absolute garbage. The reason why we can be so confident in what we do is that we have to, we live or die by our last customer, we either do a great job or we disappear and of course some do, but nearly 20 years in this business I think means that we do our job well. However what we dont have is access to manufacturer training programs so we have to learn the hard way – from experience, which is why we own our own 12c Spider, we bought it over 3 years ago and we used it to learn the cars without the need to learn on customers cars, within a week of owning ours we had stripped it down to a bare tub and built it back up, we know these cars. 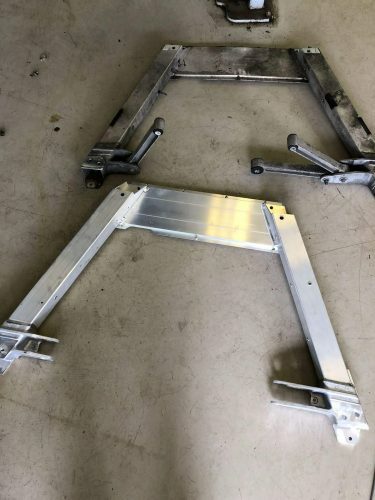 Which of course is great news when we encounter a car that needs a lot work doing to it and the work is the sort of stuff that dealers have never attempted before – a front and rear lower chassis replacement. The Mclaren range is pretty bullet proof, the carbon tub, the front and rear chassis members are astounding in their stiffness and design, its one of the reasons we got involved; sheer respect for the engineering so to have a car that has damaged front and rear sub frames (and which one of Mclarens main dealers didnt even notice when servicing the car!) means its a lot of work and requires you to know what you’re doing. Well, 27 hours later and here is what you get, pretty much a brand new car underneath, the engine had to come out (not for the subframe but for the hole in the oil catch tank) and the whole front end comes down to replace the front chassis member. Interestingly the Mclaren instructions for doing the work are woefully inadequate and in part a complete waste of time, for example for the front sub frame Mclaren state you must drain down and remove all the front suspension, the steering which mean complete re-programming whereas all we did was keep that in place and drop the front chassis member down without disconnecting anything. The rear subframe is the same, Mclaren state engine out (17 hours) but in fact you can do it simply by supporting the engine and dropping the lower part down. 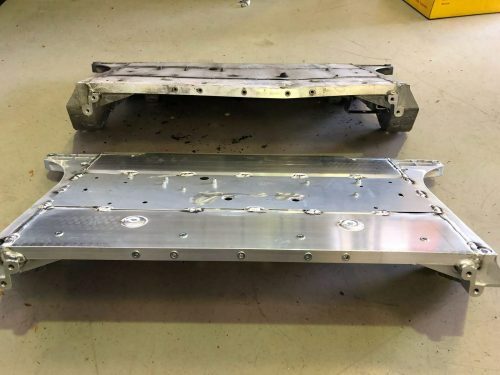 Mind you, due to the fact the oil catch tank had a hole in it and thats mounted so deep into the chassis that the engine has to come out anyway we did that at the same time. The net result for the owner is pretty much a brand new underside of the car, new front and rear lower subframes, new oil catch tank, all new undertrays and diffuser (remember the car was seen by at least one dealer who said there was nothing wrong with it – the rear subframe was so bent it had hit the gearbox!) and all covered by the owners insurance. At the same we replaced all the hose clips for motorsport specification ones and carried out a full inspection on the car so we could cover the car under our warranty. These are great cars but they are being let down by poor after sales support and to have a dealer not notice over £20k of damage to a car that they have in for work is downright criminal. We wont name and shame the dealer here, thats not our job but we have reported what we find to Mclaren, no reply as yet. Pondering a McLaren or Ferrari. I have had Ferrari before and found that with a range of independants and sources for parts, servicing and repair costs are high but not stupid. What makes me nervous of McLaren is the dealer only approach that McLaren seem to have. are all parts available to you? do you have access to McLaren service computer system – their SD3 if you like? what guarantee do you offer if any to replace the McLaren £5k pa one? 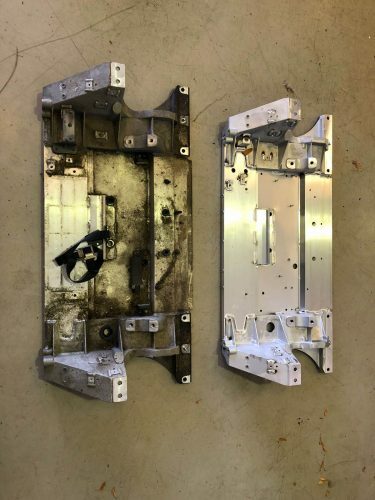 Yes, we have access to all parts. We have our own warranty, much better cover and £2850pa. Details are in the warranty section in the shop (for some reason I cant cut and paste a URL in a comment, sorry).